This video describes in detail the production process of pig casing sausage and protein casing sausage by AK6200 sausage filler (with kinking function). In the food processing industry, it can fill all kinds of sausage, ham sausage, hamburger patties, meatballs, but also can fill butter, ultra-light clay or butter-like liquid products. Suitable for protein casings, animal casings, plastic casings, etc. The machine is made of SUS304 stainless steel. The surface is sandblasted, which is more convenient for cleaning and has a beautiful appearance. Can be set in the vacuum filling, reduce the amount of bacteria survival, air bubbles, and avoid raw material proteolysis, so as to maximize the sausage color, taste, shelf life and other aspects of the quality can be the best. The stuffer can be equipped with automatic linker device, which can automatically twist natural casing, protein casing, and complex membrane sausage casing. 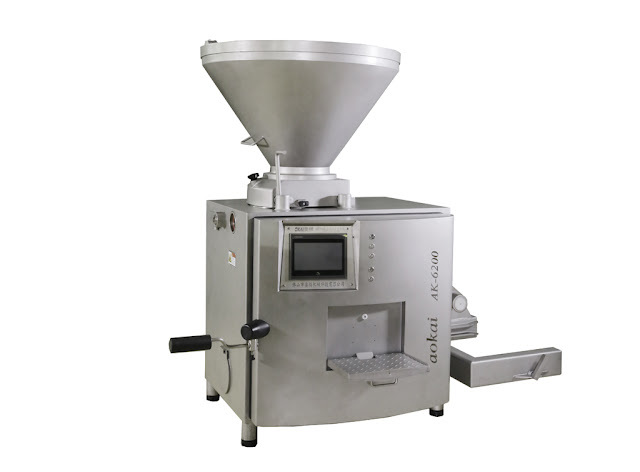 The filling speed is 0~500 knots/min, it can take length control device to make sausage with uniform length. Important parts are manufactured in excess of the industry’s highest standards to ensure accuracy and stability of the machine. Motor, reducer, vacuum pump, electrical components and so on adopt the most stable brand in the world to ensure the quality of equipment. Filling pump body, impeller, blade are using special heat treatment, the surface is extremely smooth, wear resistance, and easy to replace, to ensure the accuracy of the machine. The stuffer is very easy to clean both inside and outside, and can be washed directly with high pressure water gun.Inside with waterproof, anti – mouse, anti – cockroach and other human structure. The operation of the machine is very simple, because you can set it directly on the touch screen, just as convenient as using a mobile phone. Hot! Automatic Sausage tying machine。Filler + sausage tractor + sausage tying machine. The production efficiency: 400~800 knots/min or 800~1600 or 1600~2400. It has many advantages, high efficiency, cost saving, is the most popular sausage making machine. Sausage clipper. Special for ham sausage shaping. Filling machine + customized molding device. Produce hamburger patties, butter, super light clay, etc.